As a result of Monday’s Presidents Day holiday, Tuesday may have had a very Monday feeling to it for many who had the holiday off from work. That is until those attending and covering the Predators home game against the visiting Calgary Flames entered Bridgestone Arena Tuesday. That’s because, well, all of the Predators home games against the Flames come on Tuesdays. At least it seems that way anyway. Tuesday night was Calgary’s 34th all-time visit to Nashville, the 14th of which came on a Tuesday. That may be fewer than half of their trips to Bridgestone, but the recent history shows the Tuesday visits are much more common as of late. With the 6-5 overtime loss Tuesday night, it marked the ninth Tuesday home game against Calgary in the last 12 times they have played in Nashville, including five of the last six. The longest streak of Tuesday home games against Calgary you ask? It’s four consecutive times January 5, 2010, October 19, 2010, February 1, 2011, and December 13, 2011. The Predators are now 6-3-5 in their 14 Tuesday home games against Calgary. The last three have gone past regulation time, with Nashville dropping two of the games in overtime and one in a shootout. No matter the day, bizarre things happen when these teams get together. Filip Forsberg recorded a hat trick Tuesday night. He becomes the second Predator to get a hat trick against Calgary in a losing effort. Eric Nystrom did it first, and he did it in style, getting four goals in a 5-4 shootout loss January 24, 2014 in Calgary. If Bovada has odds on the Flames’ visits to Nashville next season, bet the mortgage on them happening on Tuesday. Momentum can be a funny thing in hockey. When you have it, everything seems to go right and when you don’t, you get things like Saturday’s “gross” performance against the Florida Panthers as per the parlance of Nashville head coach Peter Laviolette. Fewer than 24 hours later, the Predators came out of the gates Sunday with a metaphorical burr under their saddles against the Dallas Stars. There were some odd fights, bad penalties and just about everything else you could not imagine happening. “I didn’t doubt that they would be ready to play tonight,” Laviolette said after the game. Although he didn’t come right out and say it, odds are good that he strongly suggested they do so following Saturday’s performance. Even though they were playing fairly decently Sunday, they were still down 3-0 more than halfway through the game. But then the p = mv finally turned in the Predators favor. Roman Josi took advantage of a disturbance in front of the Dallas net to the get the Predators on the scoreboard. That disturbance came in the form of Viktor Arvidsson getting punched in the face and losing his helmet while falling to the ground in front of Kari Lehtonen. With a power play carrying over into the third, Nashville finally caught the break they were due from the zebras when Jamie Benn was whistled for a hooking penalty at 22 seconds of the third. Josi struck again on the 5-on-3 to make it 3-2, and Calle Jarnkrok tied the game at the 4:40 mark with an impressive wrister after using Stars defenseman Jamie Oleksiak as a screen. Arvidsson took an offensive zone penalty just 14 seconds after Jarnkrok’s goal, but in another twist of momentum fate, the Predators turned that into the game-winning goal. On the Dallas power play, Tyler Seguin tried to stickhandle into the Nashville zone at the blue line. Filip Forsberg dispossessed him and was off to the races on a breakaway. Now the big challenge for the Predators will be trying to carry the momentum of Sunday’s victory through their five-day break which begins Monday. With the St. Louis Blues seeing some results since Ken Hitchcock was given the pink slip, the battle for third place in the Central Division will be tight. Also tight will be the battle for the Western Conference’s two wild card spots, which look now to be a battle between Los Angeles, Calgary, and whichever of the Blues and Predators that does not get third in the Central. Vancouver, Dallas, and Winnipeg could also get in the wild card conversation. When they return from the break, the Predators play back-to-back road games in Minnesota and Columbus, both teams are already solidly in the playoff picture. It’s in the Predators best interest to not be gross in those games as they begin the final stretch of the season. Former Predator captain Greg Johnson has the rare honor of receiving credit for scoring a goal at 0:00 of the first period of a game. That game was played Jan. 23, 2006 in Detroit’s Joe Louis Arena. But in reality, Johnson actually scored that goal two months earlier in a November game played against the Red Wings. Midway through the first period of the Predators-Red Wings game on Nov. 21, 2005, Johnson scored a goal to give the Predators a 1-0 lead. About a minute after that goal, a medical emergency on Detroit’s bench halted the game. Jiri Fisher, a promising young defenseman for the Red Wings, collapsed due to cardiac arrest. Thanks to quick action by the team’s medical staff, a nearby doctor, and even one of the on-ice officials, Fisher was resuscitated. The game was rescheduled to be played in its entirety in January, but the league did not want to strip the Predators of the lead they had, so they started the game with a 1-0 lead with the normally impossible goal credited to Johnson at 0:00 of the first period. Nashville eventually won the game 3-2. Johnson and former Predators goaltender Tomas Vokoun were in Nashville Saturday as part of the NHL’s Centennial Fan Arena and Truck Tour. Following his time in Nashville, Johnson signed a contract to re-join the Red Wings, his first NHL team. Some preseason medical exams revealed a potential heart issue with Johnson. With Fischer’s situation still fresh in his mind, he quickly realized that his playing career was over. Asked about the status of his health currently, Johnson had good news. Prior to Saturday’s Predators game against the visiting Florida Panthers, Johnson and Vokoun spent considerable time signing autographs for fans. The first game in Predators history was played against Florida, and Johnson took the franchise’s first faceoff in that game. His most memorable goal as a Predator came in Game 4 of the 2004 series against the heavily favored Red Wings. Nashville evened the series 2-2 in that game before eventually falling to Detroit in six games. Johnson, a graduate of the University of North Dakota, has transitioned into the finance world in his post-hockey career. He laced up the skates and took a spin on the outdoor rink adjacent to Bridgestone Arena Saturday. Asked if getting back on the ice stoked a fire in him, he said that feeling the ice brought back some memories. Johnson played 502 of his 785 career NHL games in a Predator sweater. It’s no surprise that he feels a special connection to the city and to the team. “In my heart I am a Predator and a big Predator fan,” he said. It has been quite a while since Harry Zolnierczyk scored an NHL goal, almost three years in fact. But at 9:01 of the second period Thursday night, Zolnierczyk ended the 1,087 day drought with a hard-nosed goal that put the Predators ahead of the visiting Columbus Blue Jackets 2-1. Nashville’s lightly used fourth line of Colton Sissons, Cody McLeod, and Zolnierczyk was buzzing around the Columbus zone. Battling Blue Jacket defenseman David Savard in front of goaltender Sergei Bobrovsky, Zolnierczyk got just enough of a backhand shot to make it across the goal line while he was falling to the ice. It was his first since Feb. 5, 2014 when he was a member of the Pittsburgh Penguins. Since his time with the Penguins, Zolnierczyk has had very brief NHL stops on Long Island (two games played) and with Anaheim (one NHL game played), as well as AHL stints with Wilkes-Barre, Bridgeport, San Diego, and Milwaukee. Zolnierczyk looked like he was going to get on the score sheet early Thursday night as he carried the puck into the Columbus zone on a 3-on-1 rush two minutes into the first period. Bobrovsky turned aside his shot, and Zolnierczyk’s momentum carried him hard into the end boards. Nashville’s coaching staff only gave Zolnierczyk 6:43 of ice time in the game, but he was noticeable each time he was out there. Laviolette was effusive of his praise of his fourth line, all of whom played fewer than nine minutes in the game. The Predators star players recognize the value fourth liners like Zolnierczyk bring to the team. Entering Thursday night’s game against the visiting Boston Bruins, the Predators were a banged-up team. Exiting the game, the injury picture is worse, possibly much worse depending on the status of star defenseman Roman Josi. At the 15:31 mark of the first period, Josi was hit high, hard, and late by Boston’s Anton Blidh in the left corner of Nashville’s defensive zone. Exacerbating matters was the fact that Josi’s stick was up, hitting him in the face as Blidh finished his hit. Josi fell to the ice immediately and stayed there for several seconds before skating off the ice to Nashville’s dressing room in great distress. Josi did not return to the game, with the team announcing he was out with an upper-body injury. Predators head coach Peter Laviolette was succinct when asked his opinion of the hit postgame, “I thought it was late and dirty,” he said. In the oddly rough game played between two teams who don’t see each other very often, Josi’s minutes were divided among the Predators other blueliners, most notably to Mattias Ekholm, who played 29:11 and Anthony Bitetto. Bitetto’s 20:08 of ice time Thursday night is nearly double his season average. When your name is called every other shift, getting a quick breather on the bench is key. Bitetto has had a tough season to date, sustaining two long-term injuries and just returning to the lineup in the last week. Laviolette was impressed with the response he saw from Bitetto’s increased minutes. With the Predators headed out on a five-game road trip that starts Saturday in Colorado, the health of their blue line is of significant concern. With P.K. Subban still sidelined with an upper-body injury of his own, playing a significant number of games without their top two defensemen will be a difficult test for their remaining blueliners. Heading into Tuesday night’s matchup against the visiting Montreal Canadiens, many Nashville Predators will be facing former Predators captain Shea Weber for the first time in their NHL careers. When asked about it following Monday’s practice at Ford Ice Center, they were all looking forward to the new challenge. Predators goaltender Pekka Rinne has faced countless thousands of Weber shots in practice over the years. He was asked what sets Weber’s shot apart from other players who shoot the puck hard. Weber is the two-time defending champion of the NHL’s Hardest Shot Competition at the All-Star weekend’s skills competition. He won last year’s event in Nashville with a shot of 108.1 mph, which was just four-tenths of a mile per hour slower than his 2015 winner. With eight power-play goals this season, Weber leads all NHL defensemen and is tied for second overall, one behind Pittsburgh’s Sidney Crosby. As much as a handful as Weber is in his team’s offensive zone, he is equally difficult on opponents in Montreal’s defensive zone. Weber leads the Canadiens and ranks eighth in the league, averaging 26:02 of ice time per game. Like Rinne, many of Nashville’s forwards have battled Weber in practice for years. With the intensity that Weber brings to the practice ice, his former teammates know that they are in for a long evening Tuesday. Filip Forsberg has been on an offensive tear lately, posting five goals in his last six games. He knows that battling against Weber will be tough, but he is looking forward to seeing how he measures up against him. “You always want to match yourself up against the best, and he’s definitely one of them out there,” Forsberg said. Throughout his NHL career, no one has had a better view of the work Weber does in the defensive zone than Rinne. David Poile sent Weber to Montreal in exchange for P.K. Subban in a late June blockbuster trade. Poile spoke with the media following Monday’s practice. A large number of Montreal scribes were there to hear Poile’s thoughts. It started out as a tweet of a picture of an adorable Yellow Labrador Retriever sitting on the glass at Friday night’s Nashville Predators season opening game against the Chicago Blackhawks, and the legend of Annie the service dog has been growing ever since. As Annie rested underneath a patio table at a Brentwood Starbucks lapping up a puppuchino, Josh Ray, Annie’s owner, was asked how she is handling her newfound fame. Due to many requests, Annie, who will turn 2 January 1st, now has her own Twitter account. Of course with all of this attention, Annie did need to do some shopping in hopes of going incognito when she wanted some privacy. 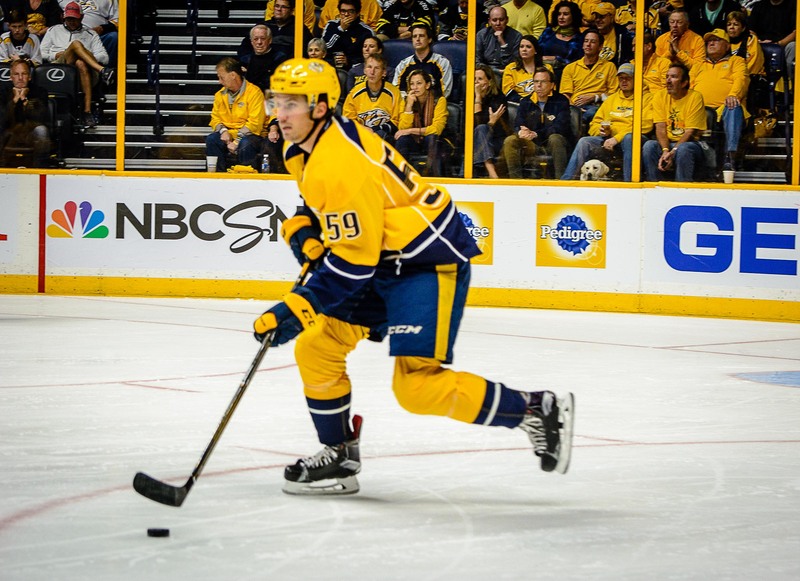 Storylines were abundant in Friday night’s season opener for the Nashville Predators. The first game of the season, sure. P.K. Subban’s first game as a Predator, no doubt. A win over the Central Division Blackhawks in a tightly-played one-goal game? Absolutely. The power play firing on all cylinders. Yes. But tonight, I am writing about a photo, and a slightly out of focus one at that. Shooting from a photo hole in the Predators defensive zone in the second period, I had a good angle of Roman Josi carrying the puck up ice, so I started firing the camera. I thought I had some good shots, but when I ran back upstairs to edit, I noticed the photos were a little out of focus. Taking hockey pictures can be extremely frustrating. With the speed of the game, locking in tack-sharp focus can be difficult. You throw out a whole lot more than you keep. Getting ready to dump that series of shots into the laptop’s trash, something caught my eye. There, just above the Pedigree dasherboard advertisement, focusing intently on the action on the ice. You can’t trash a photo like that, even if the hard to take a bad picture of Roman Josi is a little blurry. A photobomb like that is just too good not to share. So, I threw it out on Twitter and my mentions, well, they were flying fast and furious for the remainder of the game. Not wanting to miss an opportunity to find out who this dog, and oh yeah his owner, is, I ran downstairs to the 100 level. At the under 6:00 media timeout of the third period, I made my move. Media timeouts in hockey are just 90 seconds in length, so not wanting to disturb the fans in the high priced seats near the glass while the action was going on, I had to work fast. In a one-goal game between the Predators and the Blackhawks, tensions can run high. After introducing myself as a writer and a photographer, I told the surprised gentleman that I captured an interesting shot of his quadruped and asked if I could have his permission to use the photo in a post. He was more than happy to allow it. The owner’s name is Josh Ray, and his furry friend is an adorable Yellow Labrador Retriever named Annie. In addition to being cute, Annie is Ray’s service dog. The game was Annie’s first hockey contest, and Ray said that she handled the noise and excitement like a champ. Service dogs are trained to handle all kinds of different circumstances, and with more than 17,000 yelling fans, loud music, and goal horns Annie just took it all in stride. And since my mom’s name is Annie, well that just makes this story even more awesome because my mom is the coolest person I know. Oh, and conspiracy theorists, Josh and Annie were not planted there by Pedigree, it was just a crazy coincidence. Playing his first competitive game since March 10th, P.K. Subban thought that he was rusty. But it did not take long to shake off that rustiness or any lasting effects of the upper-body injury that has nagged him since the start of training camp. Subban took to the ice for the first time in a Predators uniform Saturday night in a preseason tilt against the visiting Tampa Bay Lightning, a game the Predators won 4-3. After notching an assist on Nashville’s late first period power-play goal, Subban tallied a power-play marker of his own at 5:56 of the middle frame. The only defenseman on the ice for the man advantage, Subban slid to the left point. Subban’s fellow former Canadien Mike Ribeiro sent a cross-ice pass from above the right circle to the right-handed shooting blueliner. Following his windup, Subban connected with the puck, which was perfectly positioned between his skates. As he followed through, Subban fell to one knee and the puck sailed by Lightning goaltender Ben Bishop. Subban’s upper-body injury kept him out of training camp’s on-ice activities until Friday’s practice. Possibly saving his best goal-scoring celebrations for the regular season, Subban simply lifted his right leg and waived his right arm above his head in a circular motion twice before skating toward Ribeiro to acknowledge his pass before the remaining Predators on the ice at the time of the goal joined the hug fest in the high slot. The Predators used four forwards and one defenseman almost exclusively on the power play Saturday night. Playing without Ryan Ellis, who is out with an upper-body injury of his own, and Roman Josi, who is just getting back into town following the World Cup, the team was without two players who log big minutes with the man advantage. With so many talented offensive players both at forward and on the blue line available to him, making decisions on who gets power play time this season will be a tough decision for head coach Peter Laviolette. A trade to Nashville will let P.K. be P.K. Several different cities can be included in the conversation of where hockey’s biggest stage is, but if that conversation were to be had, Montreal would have to be in running for that fictional award. Nashville will probably never be in that discussion, but it is certainly no stranger to glitz, glam, and the entertainment spotlight. In Montreal, Canadiens players are under the microscope 24/7, in two different languages to boot. Stanley Cups are expected, and when they don’t come, the natives get restless. Now P.K. Subban will be calling 501 Broadway home for 41 games per regular season and what Predators management and fans hope to be many more in the postseason. In a town full of them, a new star has metaphorically been born in Nashville. This isn’t a knock on Shea Weber, but about all he has in common with Subban is that they are both right-handed defensemen. While a star and the face of the Predators, he was happy to fly under the radar, just coming to the rink and doing his job then going home. On the ice, there is no question that Subban is one of the top defensemen in the National Hockey League. That will not change, and with the supporting cast in Nashville on the whole being better than what he had around him in Montreal, the argument can be made that Subban may shine even brighter in Predators gold. But he isn’t just a hockey player; he is a showman as well. During his introductory conference call with the Nashville media Wednesday afternoon, Subban wasn’t afraid to let that personality shine. When asked about the existing talent on the Nashville blue line, Subban gave an indication of what a delightful human being Predators general manager David Poile acquired. Subban, who essentially lost an organizational faceoff with Habs head coach Michel Therrien, will be allowed to be himself in Nashville. Therrien once banned Subban from his post victory triple-low-5 celebration with goaltender Carey Price. Seriously, this coach thought that such a celebration was an affront to the game of hockey. When the fun police run amok, everyone loses. There’s a difference between having fun celebrating with your teammates and showing up your opponents. During his Wednesday afternoon press conference, Poile sounded as if he will be wearing a Subban jersey to games instead of his standard-issue business suit. With an endorsement like that, Subban can triple-low-5 Pekka Rinne, Gnash, Craig “Partner” Baugh, and the beer vendor in Section 101 if he so wishes. The most famous stage in downtown Nashville is located inside the historic Ryman Auditorium. But when the Predators take to the ice this fall, there’s no question that Subban will bring more eyes and attention to the big building just a couple of blocks to the Ryman’s south. Heck, he may even come all the way upstairs to triple-low-5 the overly enthusiastic spotlight operator over the pressbox. Without a crabby coach holding him back, there is no telling what Subban may do in Nashville, on, off, or even above the ice.